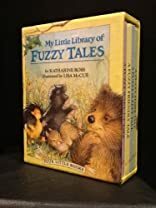 My Little Library of Fuzzy Tales is for Baby to Pre-K. My Little Library of Fuzzy Tales was written by Katharine Ross. My Little Library of Fuzzy Tales was published by Random House Books For Young Readers. Subjects of My Little Library of Fuzzy Tales include Children's 4-8, Children: Babies & Toddlers, Juvenile Fiction, and Non-Classifiable.